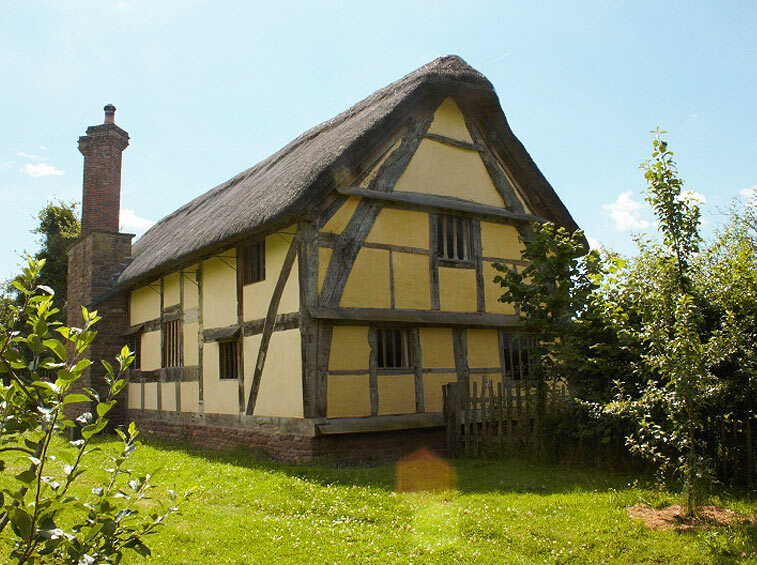 Hacton Cruck sleeps four in two bedrooms, and an additional two in the bed cupboard on the gallery. The downstairs bedroom has two single beds and is conveniently located next to the bathroom; the upstairs bedroom has a king size double bed. The bed cupboard is a standard width double though is four inches short of a standard length. All beds are by Hypnos, bedding by Bedeck with a choice of duvets by Surrey Down, either down or allergy free synthetic. 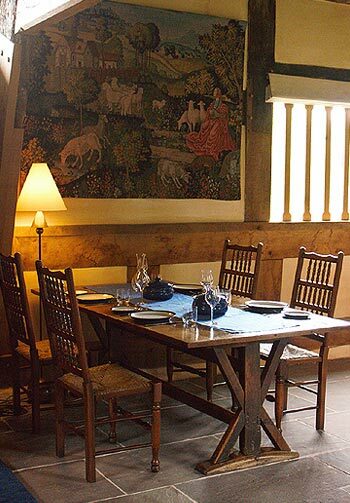 The furnishings are predominantly modern for a comfortable stay. Sofas by Himolla. Bedroom furniture is contemporary solid oak. The kitchen has an induction hob, electric oven, fridge and dishwasher, separate freezer and additional storage in the wall unit. 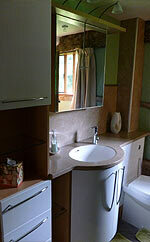 The bathroom; a good sized shower, WC and basin built into a unit with plenty of storage. The washing machine is under the stairs. From mid-September to the end of April the under-floor heating is on (powered by a ground source heat pump located in an outside shed) to gently warm the flagstone floor. At any time of the year the wood burning stove in the open hall may be lit to provide additional heat and atmosphere. A selection of books of local interest is provided, as are puzzles and board games. The television comes with built in DVD player and a collection of films. Broadband and telephone are connected. All bedding, towels and tea towels are provided, as is washing machine and dishwasher powder/liquid, cleaning materials etc. Milk in the fridge, tea and coffee in the cupboard. Information regarding places of interest and things to do is available at the house, as is a fuller history of the property and its restoration. Outside, sheep graze up to the front of the house while the back is fenced off, and private with a pleasant outdoor seating and barbecue area. A path leads to a shed with a good supply of dry firewood. The driveway leads to the back of the house where there is parking space for two cars.ced off and private with a pleasant outdoor seating and barbecue area. A path leads to a shed with a good supply of dry firewood. The driveway leads to the back of the house where there is parking space for two cars.